Someone gave me the link to affordable BikeMaster brand handlebars at AZMotorsports years ago when I was looking for cheap SuperBike bars. Well, that company was acquired (by RideNow), and the website has changed 50 million times, and at last check seems just about impossible to navigate to find the bars. I have these superbike bars on my first 750 and my 400. The bars have held up for me very well in the handful of years of regular use since 2004 or so. No rust (though kept indoors), and still appear to be the same shape in which I got them. I happen to think that SuperBike style bars are the perfect handlebar for the ’76 – ’79 750 Twin (maybe later ones, too, but I don’t have one). The bike is naturally high in front, so the SuperBike bars don’t end up being as low as you might fear. Not too much pressure on the wrists, just a perfect up-lift from the air draft at speed. Z1 se;;s Emgo brand, just received my new Daytona bars today. I like the SuperBike bars on the 750 also, but I needed a taller bar so I can install my windshield. Most important thing to remember when shopping for bars, 4 3/4″ center distance, otherwise the hold down clamps will get cocked at an angle and won’t seat. 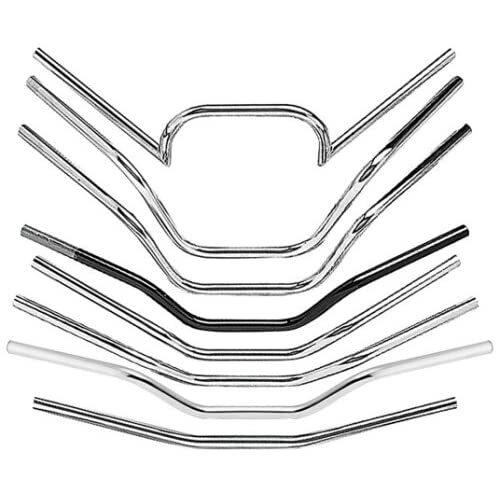 I bought my Bikemaster drag bars from Bikebandit,they were the lowest priced that I found. I changed over to bars off of a honda cb 900,they fit and gave me the feel and ride position right for me. I just recently purchased a 1977 KZ750. I love the bike. Its alot of fun. I would like to see some pics of some taller handlebars on the kz750. Anyone have any pics? Glad you like the bike, I love mine too. Taller bars? Do you mean taller than stock? I think the stock ones had something like a 6″ rise, if I remember correctly. I couldn’t stand them actually, and have replaced mine on my two 750’s with a 2″ rise (so-called “superbike” bars) and a 4″ rise on the other. Funny enough, I just put those old stock 750 bars on my ’82 KZ550 LTD, because the high stock bars were *insane* on that, and the stock 750 bars are at least *tolerable* (though not preferred) by comparison..